Demonic Possession: Psychiatrists Coming Around to Believing In It | Have Ye Not Read? Some prominent psychiatrists are finally coming around to the understanding that “demonic possession” (i.e., possession by evil spirits) is quite real. But in many cases, these psychiatrists end up succumbing to a belief in man-made religious rituals such as “exorcism” as the means of dealing with such a situation. Below, we’ll take a look at why one prominent psychiatrist has come to believe that possession by evil spirits is real. Afterwards, we’ll briefly examine the unsavory man-made origin of the rituals of exorcism and why they’re completely unbiblical. In a recent news article titled “Demonic Possession Is Real and Victims Seeking Exorcism Should Not Be Ignored,” a prominent mainstream psychiatrist, Dr. Richard Gallagher says he believes demonic possession is indeed very real. Gallagher, who trained in psychiatry at both Princeton and Yale, works as a consultant (in a mental health capacity) with the Catholic church and other religions organizations, essentially as a discerner of whether or not a person is genuinely possessed by evil spirits, or might instead have serious mental problems. His medical assessment, according to the article, helps the Catholic Church as well as other religious organizations, determine whether an exorcism is needed, or psychiatric treatment is needed, instead. “He is not the only American psychiatrist who evaluates for possession – there are many others who consult on discernment. But Dr Gallagher is one of the few who is willing to talk about it. …Speaking to the Telegraph at his office in Westchester County New York, Dr Gallagher said that while possession is very rare, in his medical opinion, it is real. “In his multiple consultations with Julia, Dr Gallagher heard a demonic voice taking over. “Such people could be suffering from seizure disorders or other neurological disorders such as temporal lobe epilepsy. People hearing the devil’s voice might be psychotic and having auditory hallucinations. “…borderline or anti-social people can have an internal battle of evil warring with a sense of decency. People who are suggestible and the histrionic may have the misconception that there is a demonic presence around them and/or that they are being manipulated by other people into believing that. He went on to explain that, for example, a possessed person might know things he or she otherwise could not possibly know, such as what someone was doing at a specific time and place when the victim of possession was thousands of miles away. A victim of true demonic possession might also display the sudden ability to speak clearly in a foreign or obscure language they’d never known, according to Gallagher. Dr. Gallagher may be today’s most well-known psychiatrist who agrees that demonic possession is real. But he’s certainly not the first. For example, noted author and psychiatrist M. Scott Peck, author of the best-selling self-help book The Road Less Travelled, discussed demonic possession and the supposed need for ritualistic exorcisms in great detail in 2005, in his book, Glimpses of the Devil: a Psychiatrist’s Personal Accounts of Possession, Exorcism and Redemption. The point being, some prominent psychiatrists are slowly — very slowly — coming around to the fact that while there’s certainly not an evil spirit behind every bush, there is nevertheless such a thing as possession by evil spirits. And it’s quite distinct from mental illness. I found the above news article to be fascinating. Are rituals of exorcism Biblical? Are practitioners of the occult arts the only people being possessed today? In the news article, Dr. Gallagher claims to believe that “demons” — which the Bible actually refers to as evil spirits — are in reality fallen angels. But as Christians we have to go to the Word of God itself to obtain our understanding on important spiritual topics like this. And when we do, we find that Dr. Gallagher is wrong on that count. This event (i.e., war in heaven) clearly takes place in heaven, right? That’s where the passage tells us the angels are. And this particular event does not and cannot happen until the final days of this flesh earth age, when that old dragon, Satan, is cast out of heaven to come to this earth in his role as the false Christ — the antichrist — in order to work his great deception. But when that event finally takes place, Satan will indeed be accompanied to this earth by his fallen angels, as the verses from Revelation 12 above reveal. In other words, the fallen angels are cast out of heaven to this earth with Satan. He doesn’t come to this earth to meet up with them. They’re with him in heaven right now…they’ll be with him in heaven when that “war in heaven” starts…and they’ll be cast out of heaven and to this earth with him at the very end of that war. So until that “war in heaven” takes place, Satan’s fallen angels are being held in heaven, by God. They’re not roaming this earth possessing people. Therefore we must take great heed to distinguish between evil spirits and fallen angels. To claim an evil spirit is a “fallen angel” is, simply put, unbiblical. You can’t make it work and stay true to the Word of God. Does it Really Take Rituals of Exorcism to Cast Out Demons? The news article about Dr. Gallagher also discusses religious rituals known as “exorcisms” which are supposedly designed to expel evil spirits from possessed people. But Biblically speaking, the casting out of evil spirits is not accomplished through some complex ritual, or with any particular special ritualistic training. Instead, it’s accomplished through a firm command spoken in unwavering faith in the name of Jesus Christ (i.e., Luke 10:17-20, Mark 5:8, Mark 9:25). In very special cases, an evil spirit can be cast out through some other simple act of faith in Christ (Acts 19:11-12). We’ll discuss that a little bit more in just a moment when we go to Acts chapter 19 to see the New Testament’s one and only mention of exorcism by name. We’re also told in the Scriptures, by Jesus Christ Himself, that on rare occasions “prayer and fasting” is needed to cast out an evil spirit, depending upon the type of evil spirit being cast out (Mark 9:29). But that’s a very special situation. Rituals of exorcism, on the other hand, are never mentioned in the Bible as a Christian methodology for casting out evil spirits. In other words, man-made religious rituals such as “exorcisms” are not Biblical examples of casting out evil spirits. Simply put, they’re religious traditions. And in a moment we’ll take a look at where these religious traditions originate. Why Is Exorcism Only Mentioned Once in the New Testament? Indeed, the one and only time the ritual of exorcism is mentioned in the New Testament is in a passage in Acts chapter 19. And it turns out that the “exorcists” being spoken of in that chapter were not Christians at all, but instead, “certain of the vagabond Jews” who were quite apparently failing at their jobs as exorcists of evil spirits, big-time. You know from your previous studies that “vagabond Jews” are not members of the Biblical tribe of Judah, but instead, are largely composed of the wicked sons of Cain (Genesis 4:12; John 8:44). That’s why, in Acts chapter 19, St. Paul takes great pains to specifically identify the exorcists as “certain of the vagabond Jews.” He wants you to know that their attempts at “exorcism” of evil spirits were not of God. We’ll go to Acts chapter 19 and take a look at that passage describing the “exorcists” in just a moment, because there’s something very important there I want you to see. But first, what does the word “exorcist” actually mean, as used in the one and only passage in the New Testament that discusses the subject of exorcism by name? After all, the Word of God, rather than the traditions and rituals of mere men, should be our chief source of knowledge for all things spiritual, right? And when it comes to something as serious as casting out an evil spirit, I think you’ll agree it’s important to get our facts from the Word of God, and not from some news article. From G1844; one that binds by an oath (or spell), that is, (by implication) an “exorcist” (conjurer): – exorcist. Clearly, ritualistic exorcism has to do with using spells and conjuring tricks that are supposedly designed to bind an evil spirit so it can be cast out. It’s not a Biblically proscribed method of casting out evil spirits. You won’t find any “spells” or conjuring tricks in the Bible. No ritualistic ceremonies. No special ritualistic or repetitive prayers. Indeed, in the only Biblical passage that actually uses the word “exorcists,” the individuals conducting the ritual of exorcism — those “certain of the vagabond Jews” — had utterly failed in their attempts to cast out evil spirits. They were essentially looking for a new way to accomplish the task of casting out an evil spirit. So they settled on using the name of Jesus Christ, whom they had heard St. Paul preach. Let’s take a look at what happened in that particular passage of Acts chapter 19, because, as you’ll see, I believe it reveals the origin of conducting ritualistic exorcisms — and that origin is not too respectable. It’s certainly not Biblical. So how did the ritual of exorcism get started within Christianity, when conducting such rituals is not a Biblical topic? The term “special miracles” means they were quite unusual miracles. They were, to put it simply, unusual and extraordinary miracles. In other words, faithful Christians would take from St. Paul items of clothing such as handkerchiefs or aprons, and bring them to the sick. 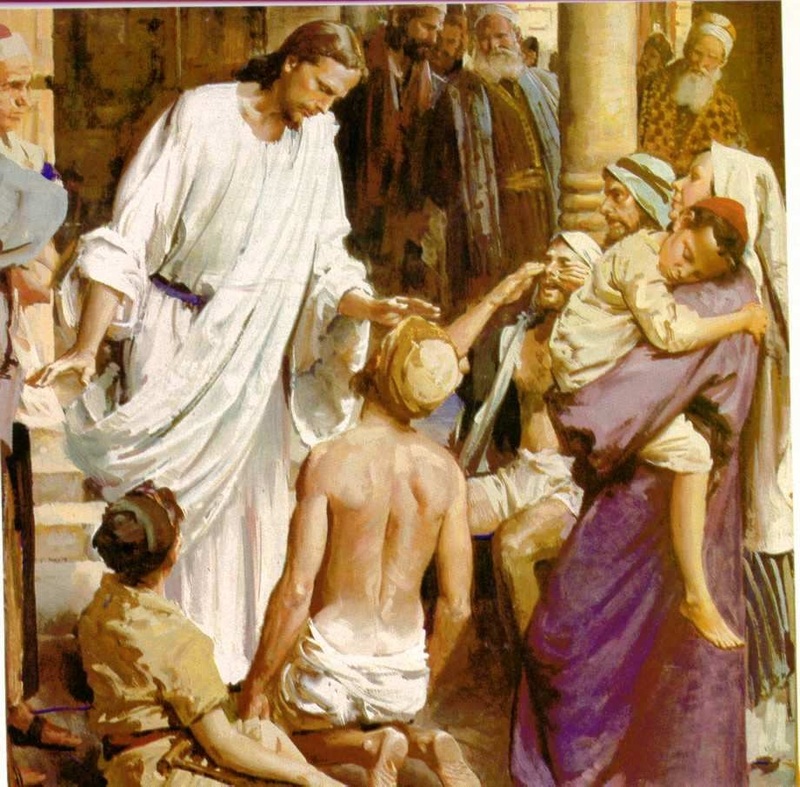 The sick, in turn, would then be healed of their diseases. And if they had evil spirits, those evil spirits would depart. Why? Simply put, because of the faithful act done in the name of Christ Jesus. Indeed, the above passage tells us that God Himself wrought these “special miracles” through St. Paul. So this was not the usual way of casting out evil spirits, which is generally done by voice command, in Jesus’ name, from a faithful Christian. Instead, it was a quite unusual way that was allowed by God to draw attention to Paul’s teaching of the Gospel. And as you’ll see in the remaining verses, it accomplished its purpose many times over. There’s that word “exorcists,” and as I mentioned previously, it’s the only time it’s used in the Bible. The “vagabond Jews” must have seen Paul or his disciples cast out evil spirits in Jesus’ name. So they decided to give that a whirl, since they apparently weren’t getting anywhere with their rituals and ceremonies of exorcism. The exorcists in this passage turn out to be a local chief of priests named Sceva, and his seven sons. In other words, it was a family affair. They were the local town “ghost busters,” if you will. If you had an evil spirit, you called on Sceva and his seven sons. Either way, the name is quite telling. In olden days, the term “left handed” was a euphemism meaning the person was crooked or evil in some way. Today, we still call some people “leftists,” and many of these leftists are “vagabond Jews” or are under their influence. And of course a “mind reader” is nothing more than a charlatan who professes higher powers in order to rip people off for their hard-earned money. I hope you can see where all of this is going. Clearly, the priesthood in Ephesus where St. Paul was staying had been infiltrated by the “vagabond Jew” Kenites (i.e., sons of Cain), who practiced ritualistic arts such as exorcism. In this case, one of these “vagabond Jews” had even wormed his way all of the way to the top of the heap, becoming the local “chief of the priests” in Ephesus. And he trained up his seven sons in the rituals of exorcism. The evil spirit gave the possessed man what amounts to supernatural strength. And to put it bluntly, the possessed man beat the living snot of out Sceva and his seven exorcist sons, and sent them packing. Both the Jews and the Gentiles dwelling at Ephesus heard about this great brouhaha in which the high priest and his sons got their heads handed to them on a platter by a possessed man. In other words, the people of Ephesus heard that while taking simple trinkets such as a handkerchief from St. Paul and giving it to a possessed person would cause the evil spirit to leave (because of Paul’s great faith in Christ, and Father’s miracle power operating through him), the local chief of priests and his seven sons couldn’t do anything to get rid of the evil spirit, but instead got their butts royally kicked by it. This dramatic event apparently resulted in many conversions to Christ, because the people could see that even so much as a trinket from St. Paul would cause evil spirits to leave, but the high priest and his sons couldn’t do the same thing, even with all of their rituals, or by using Jesus’ name, which they used in name only, but not in true faith. Where do you think that “chief of priests” named Sceva and his seven sons who got their butts kicked by that evil spirit learned their craft of exorcism? I believe this verse tells you. The immediate reaction of the people to the high priest’s failure to cast out the evil spirit was to publicly bring out their books on “curious arts” — a term meaning overwrought works, or thorough toil (see G-4021; G-4012; G-2041) — and burn them in front of everybody. But of course, those books of “curious arts” (i.e., spells, rituals, magic chants, etc.) were written by men. They were written by conjurers and spell casters of the Kabalistic sort, i.e., those involved in Jewish ritual magic. In other words, the incident described in these passages triggered the people to bring out their “exorcist handbooks” and publicly burn them, having seen with their own eyes their utter worthlessness, particularly in comparison to the power of faith from a faithful Christian like St. Paul. Through this incident, God’s Word that Christians would be able to exercise power over evil spirits (i.e., Luke 10:17-20) was demonstrated to be true, but the “curious arts” of the vagabond Jew “exorcists” were demonstrated to be worthless. The “exorcists” were impotent against the evil spirit. And the multitudes of people throughout Ephesus could now see this plainly. And the people turned away from such dark arts, and turned instead to the Gospel message. My main point in all of this was to demonstrate to you that “exorcisms” are not in the least bit Biblical, but instead, are simply modern-day extensions of occult arts that were practiced thousands of years ago. You won’t find anywhere in the Bible directions for conducting rituals of exorcism. No special ceremonies. No special prayers or imprecations. Nothing. Because all that’s really needed is simple faith in Christ, and the willingness to give the command to an evil spirit to leave the premises. I’m not trying to denigrate Dr. Gallagher, who works with Catholic exorcists. Nor am I trying to denigrate the Catholic exorcists he works with. I’m sure they’re trying to do good works. I’m just pointing out that rituals of exorcism — like most religious rituals — are unbiblical. If you’d like to learn about what Christians are supposed to do when they suspect evil spirits are present, see the Bible study, Demonic Activity. Do Evil Spirits Only Possess People Involved in the Dark Arts? If you read further into the news article about Dr. Gallagher, you’ll see it indicates he believes people end up possessed only after they’ve become involved in Satanism or other dark arts, which is to say, occult practices. This, too, is not completely accurate from a Biblical standpoint. While it’s indeed a fact that becoming involved in Satanism or occult practices can put one in danger of demonic possession, there are very religious church-going people who also experience demonic possession — especially when the doctrine they’re being taught in the churches is based on man’s religious traditions rather than God’s Word. In other words, evil spirits can be found right in the church. And in many cases, church goers are just as susceptible to their influence, and even to being possessed by them, as are delvers into the occult arts. This is completely Biblical. And if you’d like to read the Biblical evidence, see my recent Bible study Demonic Activity. That study will help you understand one of the chief causes of demonic activity in the final days of this flesh earth age, which often takes place right in the church. You’ll also learn more about how faithful Christians are supposed to deal with the presence of an evil spirit. The bottom line is that demonic activity — which is to say, the activity of evil spirits on this earth — is very real. And even some mainstream psychiatrists are slowly coming around to understand this, because there’s such a profound difference between mental illness and possession by evil spirits. But if you truly want to understand the subject, the Word of God is the place to go, not some news article in the daily press.